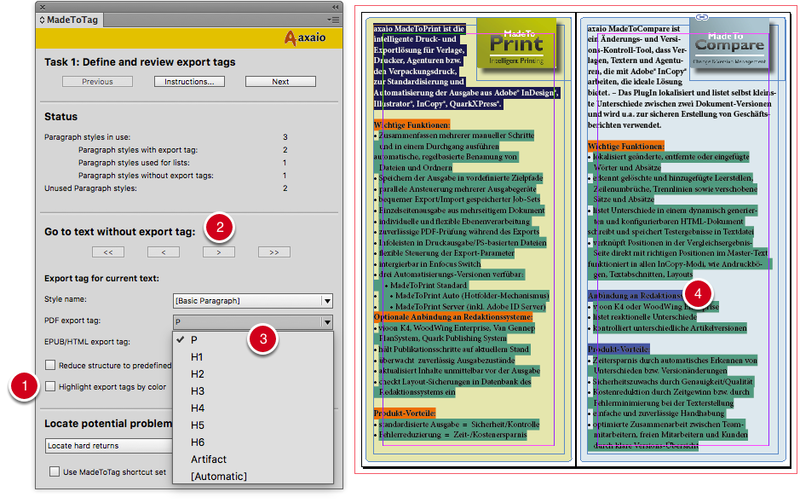 Task 1 is to add export tags to text within the Adobe InDesign document. A basic prerequisite for correct semantic structure is the consistent usage of paragraph formats. Export tags (semantic labels) are assigned to paragraph formats in order to identify the type of the content in question. For example, this could be a paragraph or a header. Adobe InDesign automatically adds the correct export tags for lists, tables and tables of content, but only when these text elements have been identified as such using the corresponding InDesign functions. 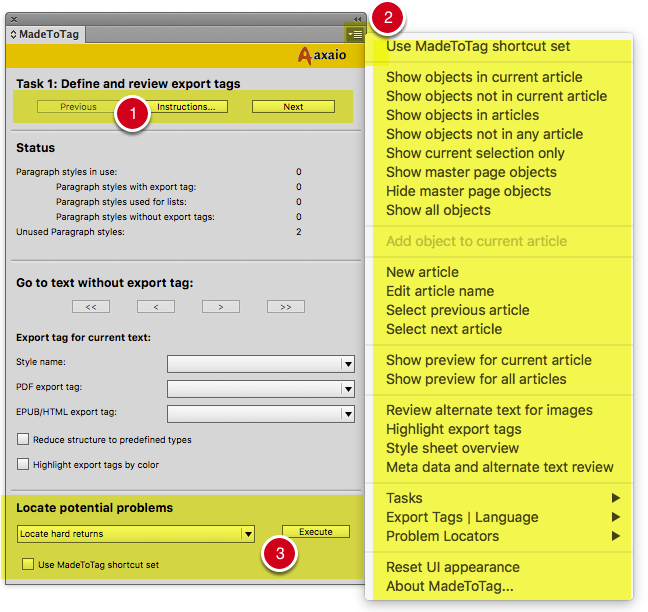 The MadeToTag window contains sections used for each of the seven MadeToTag tasks (highlighted in yellow here). At the top is the Navigation section. Use Previous and Next to move to the previous or the next task. The Instructions provide in-depth help and include a link to the online documentation. The flyout menu (upper right) leads to a range of functions which can usually also be executed using keyboard commands. The bottom of the window contains important functions used to Locate potential problems. You can also use keyboard commands here. Items 2 and 3 are described in dedicated chapters. 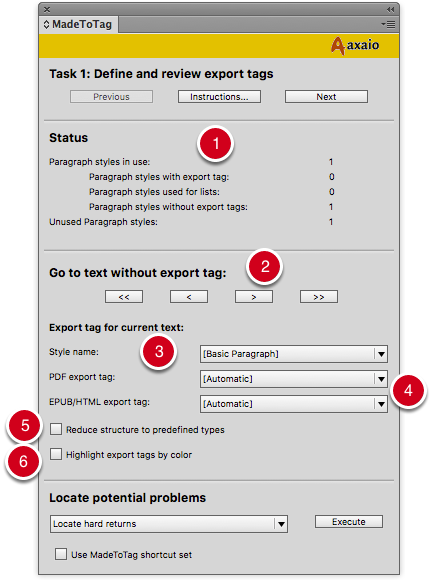 Status: Here the user will see an overview of how many paragraph styles currently feature export tags. This section also shows the number of paragraph styles used for lists, the number of paragraph styles without export tags, and the number of unused paragraph styles. Go to text without export tag: Here you can place export tags that are missing from InDesign and need to be added or changed. Use the arrows to move to the first, last, previous or next paragraph without any export tags. If a paragraph without an export tag is selected, MadeToTag will show all paragraph styles available in the Adobe InDesign document in the Export tag for current text section under Style name. You can now use two drop-down menus to select the rightPDF and EPUB/HTML export tag (P for body text; H and H1-H6 for headers and non-text elements). From MadeToTag Version 1.9(092) you have the possibility to also select additional export tags for Caption, Index and Blockquote. See section "Assign export tags: Caption, Index, Blockquote" for more details. Reduce structure to predefined types: This option makes it so that the tags in the PDF file are no longer named based on the user-defined paragraph styles (and then mapped to P, H1 etc. using the role map) but instead exclusively use the pre-defined types, i.e. P, H1 and so on. Highlight export tags by color: If this checkbox is enabled, MadeToTag will display different paragraph styles in specific colors. (Headings will be colored in orange tones depending on their level, text paragraphs will be blue, lists will be green and paragraphs marked as artifacts will be colored purple. From MadeToTag Version 1.9(093) onwards, you can not only use InDesign's predefined export tags, but also the following additional tags provided by MadeToTag. In the example document, paragraphs have not yet been given export tags and headings have been incorrectly tagged as text (P). Using the Highlight export tags by color setting, you can clearly see which paragraphs have been tagged and how: Headings are orange; text paragraphs are blue, lists are green. The user now also sees that some paragraphs have not been tagged. Using the right arrow in the MadeToTag window, the program moves to the next paragraph without an export tag. From the PDF export tag drop-down menu, you assign the currently selected paragraph (here in TXT format) the “P” tag. Finally, the user needs to assign the appropriate export tags to the two paragraphs that are actually headers and not text. Prev: How is the MadeToTag window structured?